This API allows RetroTax partners to seamlessly integrate WOTC screening, in addition to geographic and state-level tax credits, into their existing software platforms so that RetroTax can handle the back-end logic to screen and process candidates. This API documentation is intended for software developers of Human Resource Information Systems (HRIS) who aim to integrate tax credit screening into their platforms. This documentation set is geared toward full API integrations. RetroTax offers alternative integrations with varying trade-offs. For a quicker integration, we recommend the RetroTax Plugin. Please email tech@retrotax-aci.com. A preliminary discussion can determine the best direction give your company's requirements. When making a request to our API, you must use an API key in the request header. All API requests require the X-API-KEY key/value pair in the request header. This key is used to authenticate your application in AWS API Gateway for accounting and authorization purposes. If an API key is not provided, the request will fail. To register for an API key, please email tech@retrotax-aci.com . If your HRIS platform manages multiple clients, we recommend using 1 API key for all accounts. Retrotax TCID API's uses a token-based authentication system. Retrotax assigns an API Key for your application and also username and password each for hiring manager and new hire employee. For authenticating with the TCID API's you will need to send a request to the authentication API. For every subsequent secure request, you must send an api key and auth token in the header of the request. The auth_token can be found in the /authentication response above. For making requests to the RetroTax API on behalf of clients, you will need an authorization token (i.e. auth_token parameter), which is returned in response of sign in process. Temporary Auth Tokens are valid for 12 hours. After every 12 hours, the user will receive 401 status codes on all API requets until the user signs in again. Permanent Auth Tokens are assigned to a hiring manager's account during the user setup process. The auth token will be remain the same in its whole life span. Changing a permanent auth token must be done through a support request made to RetroTax. For security reasons, we recommend temporary authentication tokens. To sign out, please send a DELETE request to the authentication API with the auth token. On sucessful processing of the request, the auth token is invalidated and cannot be used anymore. The API key remains the same throughout your application; unless otherwised changed through a support request. For unauthorized requests with expired or incorrect API key/Auth Token, the secure API resource will send a 401 Unauthorized response. API integrations will primarily manage users assigned with a hiring manager role. When a hiring manager is created in the RetroTax system, it is assigned an access level, which can be one of three levels: client, company, or location (CCL). As illustrated below, the access level will vary based on your integration's setup and whether you're managing multiple clients with multiple companies and locations or a single client with multiple companies and locations or a single CCL. This diagram illustrates a client-level API user account. In this scenario, Client-Mart's API key can make requests on behalf of any of the client's associated companies and companies' locations. For example, Client-Mart can create a new record on behalf of Company-Mart-1, list the required documents for employee 8675309 in Company-Mart-2, or run a compliance report for Company-Mart-2's Location-Mart-B. This diagram illustrates a company-level API user account. In this scenario, Company-Mart-2's API key can make requests on behalf of any of the company's associated locations. For example, Company-Mart-2 can create a new record on behalf of Location-Mart-Y, list the required documents for employee 8675309 in Company-Mart-2, or run a compliance report for Company-Mart-2's Location-Mart-Z. However, this api key cannot make requests to other companies or other companies' locations, regardless of being a part of the same parent entity (Client). As the diagram illustrates, requests made to any entity shaded in red will fail. This diagram illustrates a location-level API user account. In this scenario, Location-Mart-Z's API key can only make requests on behalf of itself and the employees within that location. For example, Location-Mart-Z can create a new record on behalf of Location-Mart-Z, list the required documents for its employees, or run a compliance report for itself. However, this api key cannot make requests to other companies or even locations within the same parent company,Location-Mart-Y. As the diagram illustrates, requests made to any entity shaded in red will fail. Here's an example of a "simple" obs integration can look like and how it'll flow for an HRIS integration partner managing multiple shared clients where each client might have multiple companies and/or locations. The reason we call this a "simple flow" is simply because it combines the employee, hiring manager, and esignature steps into a single API request. Consequently, this flow requires less API calls to RetroTax's servers. In order to create new employee records in the RetroTax system, a location_id parameter must be defined so that we can associate the employee to its specific location. How you manage location IDs will be determined by your hiring manager's user account and its access level (see User Accounts section in this documentation). You will need to store the location IDs in your application, which can be retrieved once RetroTax has setup your user accounts. Call GET /companies and GET /locations to return a list of locations and their IDs. At this point, the new hire will complete the RetroTax questionnaire. From a user perspective, the new hire will be prompted to answer the WOTC questionnaire. The following is a sample UI that would need to be created within your application. Obviously, the front-end will be customized to your application's UI. Additionally, you will need to handle validations on your front-end in order to post valid requests. When a new hire completes the RetroTax WOTC questionnaire, s/he must authorize and e-sign. This is required. The wording of the authorization section can be slightly modified if needed. For instance, in a completely seamless API integration where RetroTax acts entirely behind the scenes, the "representative (Associated Consultants, Ind dba RetroTax)" portion of the authorization confirmation might cause confusion to any new hire who reads the entire section. For this reason, we can propose alternatives. At this point, your application should populate the "hiring_manager" and "e_signatures" objects in the body of the employees POST request. By far, the easiest and most common option is to default hiring manager fields to pre-determined values that matches the client's average new hire (e.g. defaulting date started work to today's date, starting wage to $10, and a common starting position, etc). By pre-defining these values, we can reduce the number of steps in the workflow and, therefore, provide a better expreience for the end-user. In this flow, you can submit the employee's recently completed questionnaire and default hiring manager info in a single request to the RetroTax API. In order to do this, include the "e_signatures" and "hiring_manager_info" like below. At minimum, your application should save the employee_info.id value, which can be used to retrieve the employee info at a later date. Use RetroTax's Automated Missing Documents Emails By default, hiring managers are sent email reminders on a scheduled job which is triggered only for records that have required missing documentation. Manage documents via the RetroTax API For a seamless integration for hiring manager users, we recommend managing documents via the API for more granular control. At this point, your application should call GET Documents to check if the new hire is required to submit supporting documentation. Depending upon a variety of factors, pre-qualified employees will need to provide supporting documents to prove their eligibility and receive a certification. The RetroTax API automatically generates many required government forms needed to process the new hires. We return these documents in the GET Documents response. While entirely optional, you have the ability to display these forms' thumbnails on your front-end, provide download links for your hiring manager, etc. 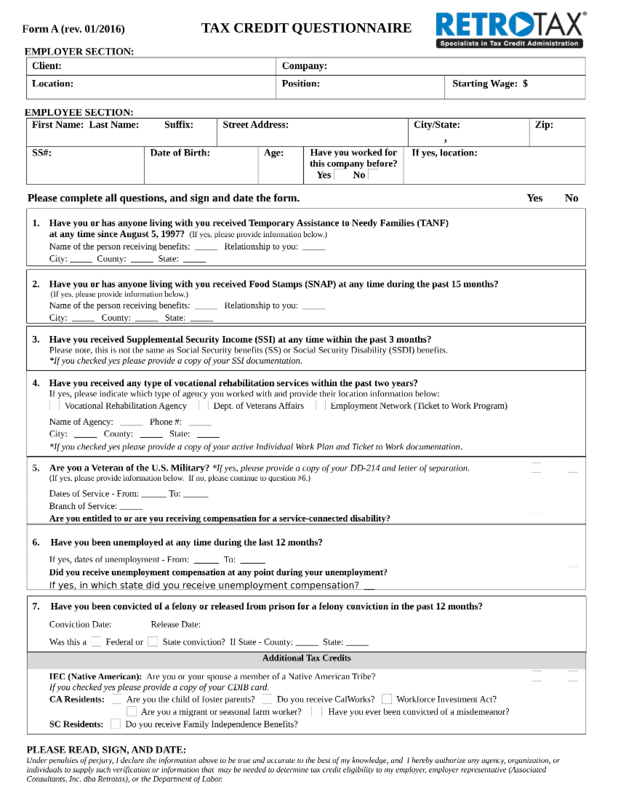 "client_help_text": "Signed Form A or ATV: a signed general release of information form. It allows us to pursue different types of documentation from outside agencies if the employee is unable to provide it. (Please send regardless of employment status.)" "client_help_text": "Proof of SSI: (Supplemental Security Income, not a Social Security card) benefits verification can be any of the following: SSI check stub, SSI Record or Authorization contact, or an award letter." Applicant Tracking System (ATS) integrations allow partnering HRIS platforms to pre-screen applicants for tax credits before the applicant has been hired. From a hiring perspective, this will tell you which applicants should eventually qualify, assuming s/he is hired. There are 3 aspects that differentiate this ATS request from the OBS request. The "is_applicant" parameter is defined and set to true in the "employee_info" object. "hiring_manager" object is absent from the request. "e_signatures" object is absent from the request. Client libraries can be developed upon request. Please email tech@retrotax-aci.com. RetroTax takes security seriously. We develop our applications with known security standards in mind (OWASP). Our security documentation extends beyond the scope of this API's documentation, as it covers personel security, operational, network, application, authentication, data, physical, etc. However, RetroTax can provide our implementation partners more detailed documentation of our security practices and policies upon request. The RetroTax Application utilizes Authlogic and Pundit for authentication and authorization. For this we used authlogic gem, which uses default encryption type SCrypt to store the passwords. The RetroTax API uses 2048-bit RSA with SHA-256 as a secure signing scheme. Data in transit and at rest is encrypted using AES-256 encryption algorithm. RetroTax conducts annual 3rd party application penetration tests on our API.